Four corners of the globe - symbolise the achievements of South Africans all over the world. Rising sun - the new dawn emerging from Africa. Mapungubwe hill - forms the background, a sandstone hill on mudstone deposit in an arid subtropical area with erratic summer rains. Excavations showed that excellence grew out of the most difficult natural circumstances. Mapungubwe rhino - the now most well-known artifact found in a grave at the excavation site, a gold-plated figurine formed around a soft core, probably sculpted wood, testimony to the excellence of human resourcefulness present in the Kingdom. 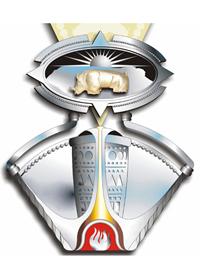 Mapungubwe sceptre - emerging from the gold melting pot on either side; another of the artifacts found in a grave at the excavation site. 6. Decorated gold melting pot - the basic symmetric forms on the overflowing gold melting pot symbolises the abundance of excellence, science and creativity, testimony to the earliest achievements in metallurgy. 7. Furnace - the purifying and life sustaining properties of fire, employed since the Iron Age, to advance development and excellence in societies and communities.